Lately I have tried to spend most of the time with my son and less on the internet. I blog mostly when I put him in bed, so my free time starts around midnight. 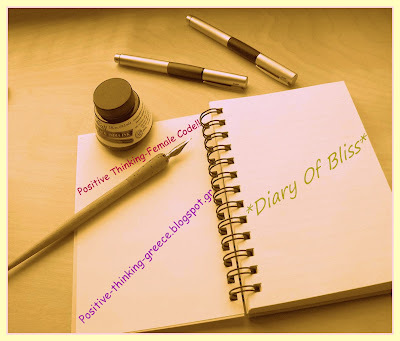 So, this is the last diary of Bliss that I should have already written, but I never had the time. That was an idea of Katerina from http://positive-thinking-greece.blogspot.gr/ to write about beautiful moments in our life. Thank you for letting me be a part of it. These past weeks were so full. Of course we had great moments at home drawing, dancing, singing and much more, but being a parent isn’t only fun. A few days ago my son had a little accident, we got so scared, but thank God it wasn’t as serious as it could have been. Again we must see the positive aspect of it as everything went fine, but no mum wants to see her child hurt. Another good day was yesterday as it was my baby’s first nameday. We went with daddy to buy new toys and many safety gadgets to cover whatever we can in the house and in the evening we celebrated! My sister made a delicious pudding we served with ice cream. My son played with his cousins and he also saw his Godmother! These days I also had the chance to meet some good friends. My friend H. came the other day and she brought a cake she had made for me. With her I remembered some things I used to do on the Internet before I discover blogging. We visited astrology sites as it’s something I always loved doing. And the best of all, she fed the baby! And last weekend my best friend and her husband came over. My son has so much fun with them that he wanted to go with them as they were leaving! We made souvlaki that I love eating and my friend made a special sauce. Hey! I have told you how to make souvlaki here.